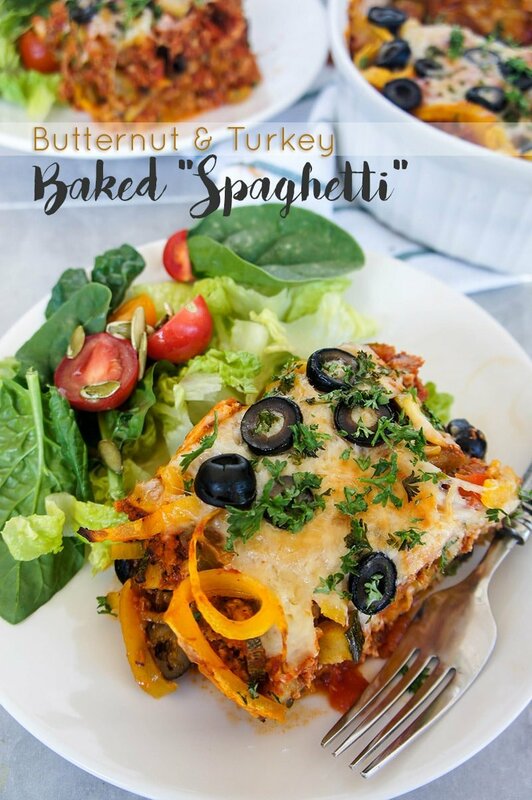 This Butternut Turkey Baked Spaghetti makes the perfect warming meal for a chilly fall day. Instead of traditional noodles, this one calls for spiralized butternut squash. I love it when I come up with recipes that I just can’t wait to share. This is one of them. I have been backloading recipes so I have plenty so share while I am traveling the next month, but this one moved to the front of the list after making it twice last week. So delicious! My brother stopped by hungry the other day, and I halfheartedly offered him the last slice. Then I was really disappointed I wouldn’t get it for dinner again. It’s only September 6th, and I have gone through 4 full winter squashes since the 1st. To be honest, I don’t really reserve winter squashes for the “right season” — I am glad these beauties can be enjoyed year round. Butternut squash noodles are a tasty substitute for pasta or other grain side dishes. I have been making them for a while, and I love to serve them with my Lightened Up Chicken Tikka Masala. The sweet noodles are delicious with the spicy tikka masala sauce! 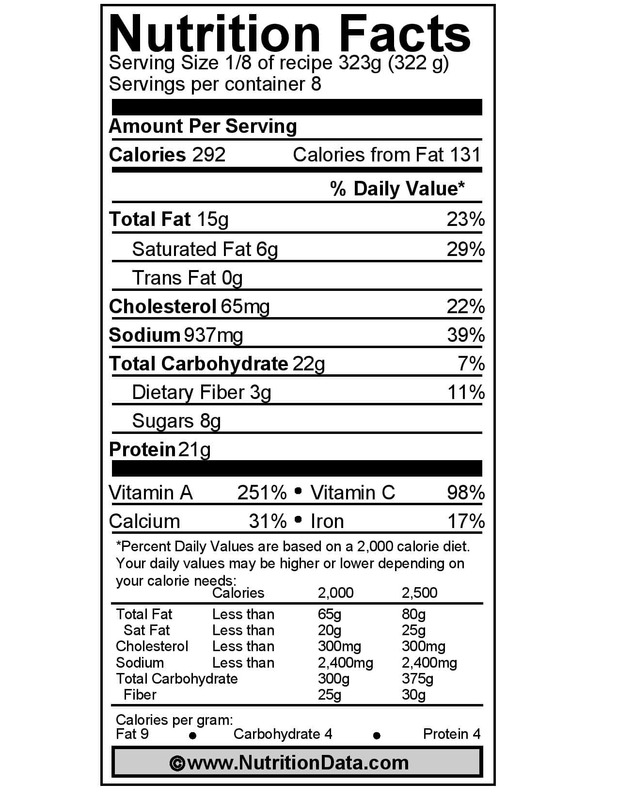 I like to substitute vegetable “noodles” in place of starches to lower the calories of dishes, and also because I feel better digestion wise when I am eating mostly grain-free (as discovered on my recent Whole30 experience). Since I finished the Whole30, I have started eating grains (mostly oatmeal, and usually just in cookies or rice crackers), but many more meals are grain free. Besides butternut noodles, I also make zucchini or beet noodles for hot dishes. With my old spiralizer, hard vegetables, like butternut and beets, were a bit difficult to make– but I recently bought an OXO, and the blade is so sharp these only take 4 or 5 minutes to make, including peeling the squash. In case you missed it, I recently posted a Spiralized Cucumber Chicken Waldorf Salad. Cucumbers are possibly my favorite and most frequently spiralized veggie! If you don’t have a spiralizer, try turning this recipe into a “lasagna” by using a mandoline or a sharp knife to very thinly slice the squash. I haven’t tried this method, but I can’t see why this wouldn’t yield a similarly delicious result. If you’d like to include pasta, try my favorite gluten free pasta, Ancient Harvest Quinoa Pasta. This makes a perfect make-ahead meal. Put together the casserole, and refrigerate up to a day before baking. The instructions include a modified baking time if the casserole has fully cooled prior to baking. 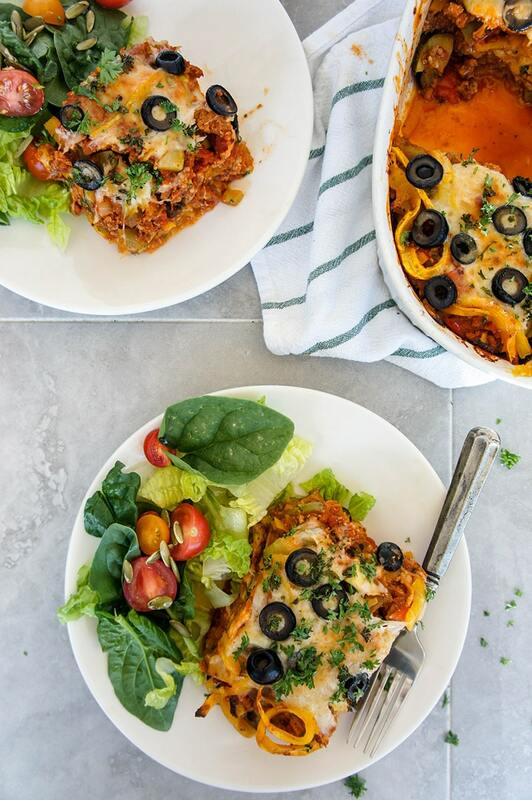 This warming and healthy fall meal is a favorite at our house! I made this "spaghetti" for my niece and nephew who are picky eaters, and both of them cleared their plates! 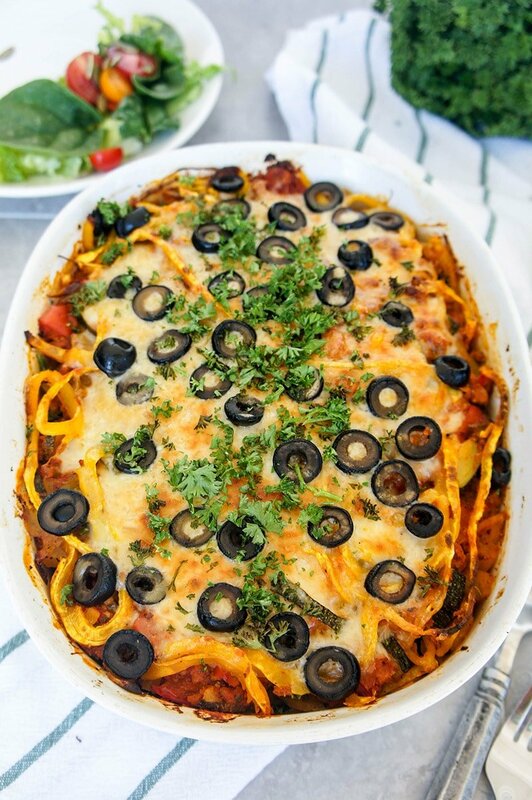 I usually don't cook with cheese because I am lactose intolerant, but when I bake a casserole like this, I just leave an end without cheese or with a light sprinkling of cheese, since the rest of the family loves it! Spiralize butternut squash with the larger noodle blade. (I recommend the OXO Sprializer ). Place "noodles" on a large cookie sheet, drizzle with olive oil, and lightly season with sea salt and pepper. Use your hands to spread the oil around the noodles. Bake for 15 minutes, until softened but still slightly underdone. 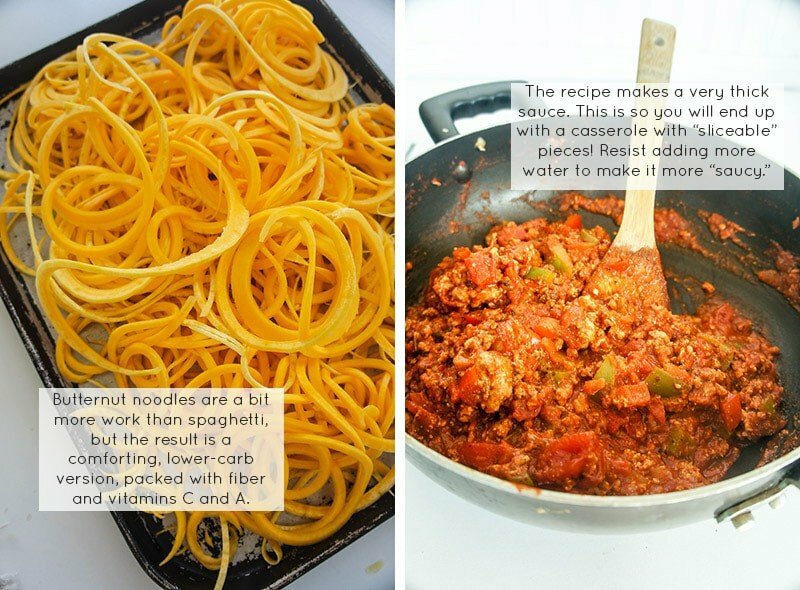 While the noodles are baking, prepare spaghetti sauce. In a large saucepan, add 1/2 tablespoon olive oil, and minced onion. Saute for 5-10 minutes over medium-high heat, until onions are translucent. Add bell peppers, and continue to cook for another 5 minutes. Move onions and bell peppers to the side of the pan, and add the ground turkey in the center. Allow to brown, then chop up and mix in with the onions and peppers, about 10 minutes. Add all the seasonings, then the tomato paste, diced tomatoes, and 1/4 cup of water. Resist the urge to "thin" out the sauce- you will want it really thick so you can "slice" the casserole. Bring the sauce to a simmer, and reduce heat to medium for about 10 more minutes. Add the zucchini, and remove from heat. Remove noodles from oven, but if planning on baking the dish right away, leave the oven on. In a large baking dish (I used an rounded rectangular 10 x 8 inch baking pan, and this recipe perfectly fills it), begin by layering in 1/2 of the butternut noodles. On top of the noodles, layer 1/2 of the sauce, followed by 1/2 of the cheese, olives and parsley. Add 1 more layer of noodles, sauce, cheese and olives (reserve 1/4 cup parsley for after baking). If baking the dish right away, bake it in the still heated oven for 30 minutes, covered (until the sauce is bubbling). Uncover the dish, and lightly brown the cheese, 5-10 additional minutes. The dish can also be made ahead and baked up to a day later. If the dish has full cooled prior to baking, preheat oven to 425 degrees Fahrenheit, and bake for 45-55 minutes covered (until sauce is bubbling). Remove the cover, and brown the cheese for an additional 5-10 minutes. Garnish with parsley, and allow to "set" for 10-15 minutes if you want the slices to come out nicely. When it's very hot, the slices won't hold as well. 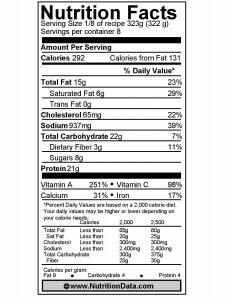 Nutritional data and images courtesy of www.NutritionData.com. I love this idea!! You know the one veggie I still have not spiralized is a butternut :O I know!!! I need to get on that this winter season! It's so good! One of my favs. My husband prefers it to rice now with a lot of dishes. Okay, I must spiralize butternut! on my list next! YUM! It was one of my firsts :) It's so delicious! If you bake it directly on a cookie sheet at 425 for about 25 minutes, it gets crunchy and really sweet where it hits the pan-- those are my favorite bits! A.) This is gorgeous, B.) I have spiralized many a veggie, but never butternut squash. Is it difficult? (I always struggle peeling the damn things! ), C.) I am so happy this contains olives. I'm surrounded by several olive-haters, and I love the italian-olive combo so much! I cannot even describe my lust for this dish!!!!! I have tried this. It is amazing. Thanks for letting me know Cheryl! It's one of my new favorites. So warming and comforting!